People who think racing is not physically demanding don't know what they are talking about. I was sore especially my right shoulder. But I didn't care I was excited for what the day had for us. First thing in the morning we were in the classroom going over what we will be doing in the morning. 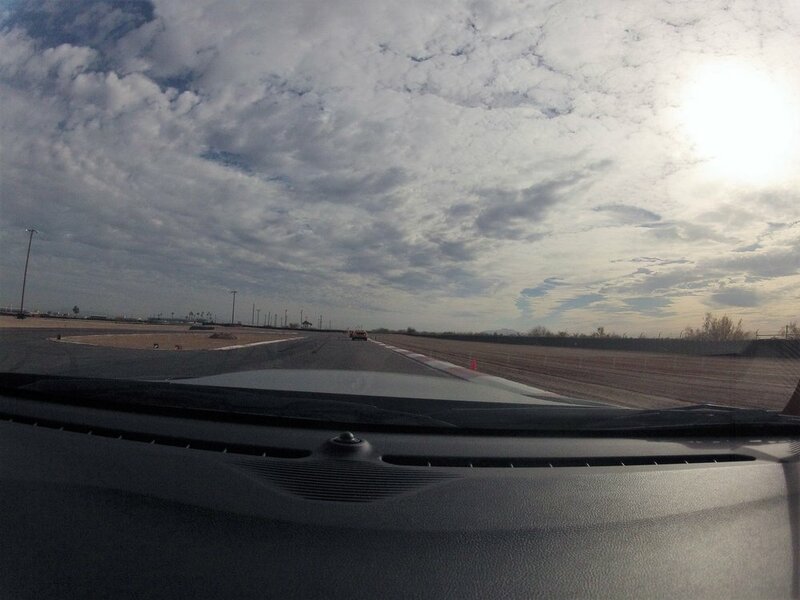 The instructor said we will be practicing downshifts with heel-toe in Maricopa Oval, skid car, and brake & turn. Yellow group got to do the skid car first. Understeer was easy to correct because I have had a lot of experience with my Subie. But oversteer that's a whole new thing. Like the other two students I completely spun out when trying to control oversteer the first time. I knocked down the apex cones with the skid frame. But hey I hit one twice and it landed in the same spot. I'm just utilizing autocross skills to keep the cone in the box, that's all, lol! The other students agree that I should get a pass in the course. My main issue was being too harsh on the throttle, which is the story of my life. My Moreno family has a problem being a lead foot. It's a true genetic problem. I know my dad is going to shake his head yes and giggle when he read this. So I had to adjust and lightly apply throttle, after awhile I got it and it was fun to correct an oversteer. It felt like a dance, a well coordinated dance. After the skid car we headed over to the oval. I was determined to master heel-toe! I was practicing in my Subie on the way to where we are staying at the RV park the night before. Transmission is broken anyway, I can't mess it up anymore (famous last words, lol). I started with normal downshifts without heel-toe to just get used to when to downshift. After 15 minutes I mustered up courage to heel-toe. Sadly I miss the first time. Next time around I think I got it. It was smooth like when the instructor was showing me. I pull over in pit lane and the instructor hopped in. I told him I think I got it and I am determined to get it right. First time around with the instructor I heel-toe and he was like that was it! Now you just need to consistently do it and continue to smooth out the movements. I WAS SO FREAKING EXCITED!!! I improved on turn 5 but now with the extra speed I am able to carry from turn 5 to 4 the instructor pointed out I was understeering a bit. I noticed I was trying to brake in corner 4 like I was in 5. We got to practice for about another 30 minutes. I was feeling pretty confident about my heel-toe technique. Right before lunch we got to practice braking at different braking distances while trying to stop the car at a specific cone gate. I found this exercise pretty easy. Then we had to practice braking and turning out of a semi Chicago box. I found this super fun it reminded me of my autocross days. Again pretty easy stuff. After recharging from lunch we went over learning the track in the classroom. Then we hopped into our instructors cars for instructions. I was making as many mental notes of visual cues to use for turn ins, braking, and acceleration. 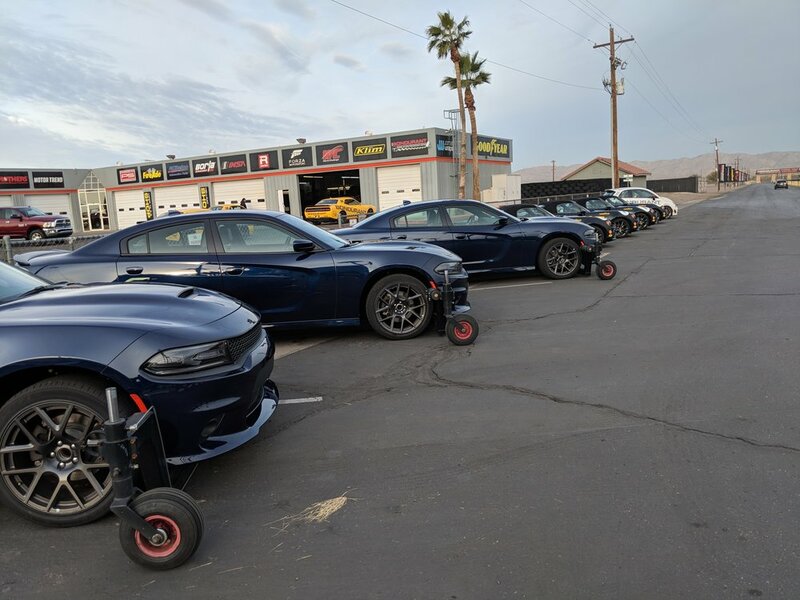 I remembered things that the instructor told us to do like, from turn 1 to 2 lightly accelerate and then lift to put the weight on the front tires to grip for the left turn. Rob is so freaking amazing, he went full out to show us what it should feel like at full speed. OMG he utilized all 700 HP! We went back to the classroom and went over any questions, comments, or concerns anyone had. Also the instructor explained that at one point they will signal with their hands in a circular motion on the straight. Which means the student follwoing the instructor will be get over to the right brake and get behind the 3rd student. The 2nd and 3rd students will acclerate to catch up to the instructor. We would repeat this routine until each student got time to follow directly behind the instructor. Then we hopped in our cars and followed the instructor. We started out slowly and went faster and faster. After a couple of minutes we got to pit and take a quick bathroom break. After the break we were left to our own devices. Hehe I was excited but very nervous at the same time. Because I know how fast I go and I know how sensitive the throttle is in the Challenger. I have to be perfect every time or I will most likely oversteer. I was suddenly overwhelmed with emotion, I was scared s***tless. But I couldn't let those emotions get a hold of me because I had to be precise on the track. At that point I let my muscle memory take over and took a deep breath and attacked the track without fear. After a few laps the instructor waves me over to hop into my car. He comments, "It looks like you are having fun out there!" I admitted to him that I was scared. And thinking about it I think I was mainly scared of my ability. I take a big breathe and do my thing. I was surprised that he had only 2 corrections for me. He praised me for doing a really good job and that I should have more confidence, but not too much confidence. The only 2 turns I had to correct was 7 to get the tire in a groove in the candy candy to set up the car straight. The other turn was right before turn 11 he said to break straight. Overall I did good! With the new found confidence I found myself catching up to people half a track away and passing them. I was riding an adrenaline high. Pushing myself and the car to the limit, there were a few times I oversteered. But it was just a gentle reminder to be easy on the throttle. I was having so much fun that I stayed out there the entire hour without a break! Can't wait for another track day tomorrow!